My Part vote for parliament. This a task that we have done in extension. It is about the party's in the government. This is my party and it is called Aotearoa Love. 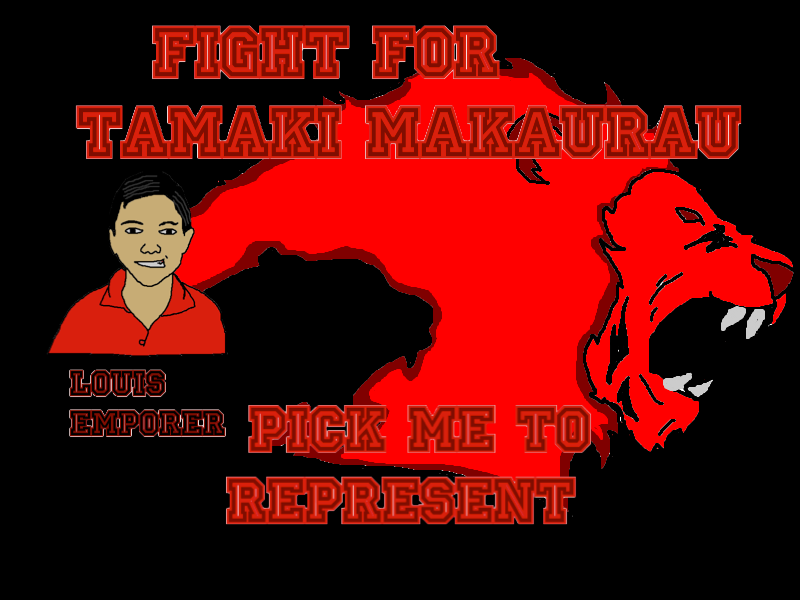 And my motto is Fight for Tamaki Kakaurau. If I ever get into parliment hopefully you will be able to vote for me. Breadfruit chips Explain everything Louis & Zane from Team 4 Pes on Vimeo. This is my movie about Breadfruit chips. I have accomplished this video with a partner. My partners name is Zane this link is to his blog. This movie is to explain how to make Breadfruit chips. Hope you enjoy!! This is a vocabulary task. It has some words in it that are from a story called Breadfruit chips. Can you Be Future focused learner? Some people may be asking what is a future focused learner well some things that Mr. Burt thinks, that a future focused learner is that you are able to be a person who is preparing themselves for an exciting world,and that you are a person who takes the opportunities given to them. If you become a future focused learner it could impact your future that is why I am asking a teacher Mrs.Nua, the head of the senior school thinks,“ You can become a future focussed learner by managing yourself well in the class and completing tasks to the highest standard that you are capable of.” For kids this mean’s if you do not manage yourself properly and spent your time looking after someone else your not going to go anywhere. The next step is that Mr.Burt has to come up with a new korero. This leaves the Point England children wandering what the next one will be. Some people may different opinions of who their favourite authors are. Well the reason I am saying this is because the Extension group had the opportunity to visit the Vodafone event centre, and were able meet some authors such as Catherine Mayo, Jill Macgregor, Paula Green, and Juliette Mclver. We got to meet them at the Storyline's festival. My favourite author had to be Catherine Mayo. Because she clearly explained what her books were about, she also used the projector which was a relief, and that her book interested me, especially the book that she wrote the Bow. This book was based on ancient Greece. If were to present one of my Book's the resource that could help understand the book would the Projector because it would make your message clear and also would pass on the experience that you had. One other author that I would have preferred to listen to was..... Paula Green. I think this because she was enthusiastic when she presented. One other reason that I liked Paula Green was because she asked the crowd to join in with the experience.